‘Waste oil’ is a term for oil that has been contaminated with substances that may or may not be hazardous. Waste oil is considered a valuable resource. Sustainable use and recycling of waste oil in times of high crude oil prices all over the globe propels the need to generate waste oil. Large quantities of waste oil can be transported by pumping through pipelines, often to locations that may not be easily accessible. This type of transportation is carried out when large quantities of waste oil are required for re-refining and recycling. Waste oil has been utilized for the last more than 50 years. Macroeconomic factors such as rise in the GDP in Europe, gradual recovery of the industrial sector in the region, and increase in the energy demand of the rising population across the world are expected to drive the global waste oil market in the near future. Developing economies offer significant growth opportunities to the market, as penetration of equipment with advanced technologies is less in these countries. In 2017, the automotive sector witnessed a rebound, due to the rising energy demand of the growing population, particularly in developed economies. This can be attributed to robust economic growth in Asia Pacific and Europe. In North America, market expansion and increase in the demand for re-refining created favorable conditions last year. These are expected to continue during the forecast period. Economic recession and political instability across the globe are likely to delay or discontinue infrastructure development activities for waste oil in the next few years. Increase in industrialization and rise in the demand for energy in most regions across the globe are estimated to boost the global waste oil market in the near future. Governing bodies impose fines and take stringent action against industries on violation of the Clean Environment Act. High installation cost of waste oil plants is likely to restrain adoption of waste oil by small industries with low capital investment. Waste oil is utilized in automotive and industrial sectors for re-refining applications. Rise in investments in automotive activities led by rapid industrialization and urbanization propel the demand for waste oil. Once waste oil is used, it can be collected, recycled, and re-used. Recently, the U.S. Environment Protection Agency has set regulatory limits for amounts of certain contaminants in waste oil. The National Oil Recyclers Association (NORA) was formed in 1985 to help promote the safe recycling of used oil. Asia Pacific is estimated to emerge as a prominent market for waste oil in the next few years. High environment-consciousness in Europe and North America is projected to drive the waste oil market in these regions in the near future. A large number of collaborations between manufacturers and technology developers is likely to drive the global waste oil market in the next few years. The global waste oil market is highly competitive. Leading players dominate the market. Key players operating in the market are Alexandria Petroleum Company, Enfields Chemicals CC, Falzon Group, Gecco Fuels, GOINS Waste Oil Company, MIB Waste Services, Oil Salvage Ltd, and Omnia Group. Waste oil can also be termed as used oil. Waste oil is refined oil that has been used for various intended purposes. Waste oil contains several contaminants, dirt, and chemicals. Re-refining of waste oil requires proper recycling and disposal techniques, which are drawn up by government bodies. This helps avoid illegal dumping of waste oil and protects the environment. New technologies in waste oil treatment and disposal enable efficient servicing and help in mitigating the risk of pollution. Implementation of stringent regulations related to minimization of harmful carbon emissions is propelling demand for waste oil. Increase in re-refining activities and growth of other application sectors are augmenting the demand for waste oil. Governments of several countries are funding and supporting the development and adoption of latest technologies in the generation of waste oil. Asia Pacific is estimated to emerge as one of the prominent regions of the global waste oil market in the near future. Europe, a highly environment-conscious region, is projected to lead the global waste oil market in the near future. The global waste oil market is projected to witness a large number of collaborations between manufacturers and technology developers in the next few years. This report analyzes and forecasts the waste oil market at the global and regional levels. The market has been forecast in terms of value (US$ Mn) and volume (kilo tons) from 2018 to 2026, considering 2017 as the base year. The study includes drivers and restraints of the global waste oil market. It also covers the expected impact of these drivers and restraints on the demand for waste oil during the forecast period. The report also highlights growth opportunities in the waste oil market at the global and regional levels. The report includes detailed value chain analysis, which provides a comprehensive view of the global waste oil market. Porter’s Five Forces model for the waste oil market has also been included to help understand the competition landscape of the market. The study encompasses market attractiveness analysis, wherein type, technology, and application segments have been benchmarked based on their market size, growth rate, and general attractiveness. The study provides a decisive view of the global waste oil market by segmenting it in terms of application, type, technology, and region. Based on application, the market has been segmented into waste oil boilers, biodiesel, special space heaters, steel mills, re-refiners, asphalt plants, and others. In terms of type, the waste oil market has been classified into lubricants, transmission oils, engine oils, refrigeration & compressor oils, metalworking fluids & oils, and others. Based on technology, the market has been segmented into vacuum distillation process, distillation hydrogen treatment, thin-film evaporation, and others. These segments have been analyzed based on the present and future trends. Regional segmentation includes the current and forecast demand for waste oil in North America, Europe, Asia Pacific, Latin America, and Middle East & Africa. The report provides the actual size of the waste oil market for 2017 and the estimated size for 2018 with forecast for the next eight years. The global waste oil market has been provided in terms of value and volume. Market numbers have been estimated for type, technology, and application segments of the waste oil market. Market volume and value has been provided for the global, regional, and country-level markets. The global waste oil market is highly competitive. Leading players dominate the market. 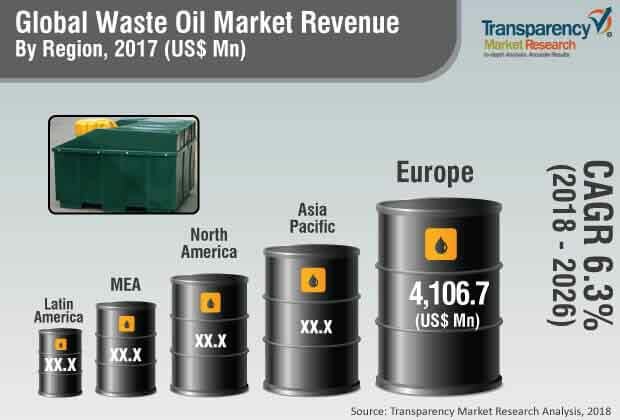 Key players operating in the waste oil market are Alexandria Petroleum Company, Enfields Chemicals CC, Falzon Group, Gecco Fuels, GOINS Waste Oil Company, MIB Waste Services, Oil Salvage Ltd, and Omnia Group. Market players have been profiled in terms of attributes such as company overview, financial overview, business strategies, and recent developments. Vacuum distillation process is also used widely. This technology effectively prevents contamination of waste oil and offers high recovery for various applications. Market share of the re-refiners application segment is estimated to increase by the end of the forecast period, due to strong focus on increasing waste oil generation activities. The segment is expected to witness lucrative growth opportunities during the forecast period.